Do you need certain essentials and fair prices of camping? 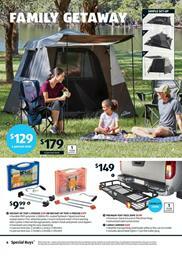 ALDI Catalogue can show you a range of tents that are high-quality items with much lower prices than a regular supplier. Get your tent at ALDI Stores on 6 April. You'll be able to buy Instant Up Tent 4-person for only $129. There is also a type with a capacity of $129. Alternatively, portable shelters that will feel comfortable and secure to have during your journey are available on pg 5. Buy Instant Up Gazebo for only $99.99 and see the instruction to realise how easy it's to set up. Visit pg 5 for the details of that and more products. Camping setup also requires comfy things to sleep with. Winter Sleeping bags will cost only $19.99. Entertaining offers like squidgies are also available in the latest ALDI Catalogue sale. Browse more in this catalogue to see outdoor clothing, coolers, very durable cookware items, and more. For example, Adult's hiking socks 2pk will cost $11.99! If you need some professional equipment for your trip to nature, you can also see the range of wildlife cameras, generators, solar panel, and more.